Basilicata’s two coasts remain remarkably unscarred by human presence; instead, they boast a luscious wildlife that glistens in the crystal waters. These natural coastlines have often won the Bandiera Blue – the Blue Ribbon for nature conservation. Different in landscape and botanical makeup the two areas share a wealth of archeological sites: from the unquestioned fame of the Magna Graecia relics on the Ionian Sea, to the extraordinary collection of underwater findings of the Tyrrhenian coast. Where the slopes of the Apennines drop sharply to the sea is the town of Maratea. Built in jumps and starts over the course of the centuries, Maratea clings to the cliff wall and follows it slowly to the coast. 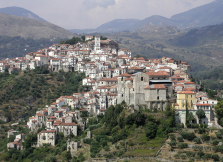 From the ancient town center located on the top of Mount Saint Biagio, a maze of medieval alleyways traverse the modern section of town, leading to Basilicata’s only Tyrrhenian port. 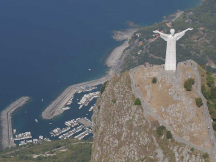 Presiding over the town and whole Gulf of Policastro, from the hill above is the cyclopean statue of the Christ, second in size only to the Corcovado in Rio de Janeiro. 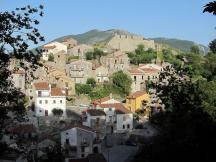 Just few kilometers inland, amid gentle wooded slopes are the characteristic towns of Trecchina and Rivello. If the first is noteworthy for its palaces with beautiful portals ornately decorated in the liberty style, Rivello, scenically perched on a high peak, deserves the nickname of “the Lucanian observation deck on the gulf”. The Ionian coast is rich with traces of an ancient people who came from the East and, following paths laid by Mycenaean merchants, merged with native populations, giving rise to a civilization of proud artistic and cultural splendor: Magna Graecia. The world of the prosperous and active colonies Siris/Eraclea and Metaponto, located in the modern borders of Basilicata, is preserved in the wonderful exhibitions of a number of local Museums and in the ancient urban centers where one can see evidence of ancient urban planning, remains of temples, theatres, and ovens of artisanal stores. Following the trajectory of Greek settlement along the rivers and towards the interior, one can begin to understand the profound impact of this colonization on the Lucanian people. Along this ideal archeological itinerary is the Romanesque style of the Church of Anglona built near a prehistoric settlement. 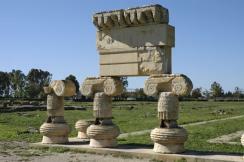 Further down the road are the numerous museum collections in Matera, Potenza, Melfi, Venosa , Grumentum e Muro Lucano. 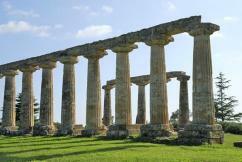 A typical stop on this itinerary is the Archeological Park of Serra di Vaglio. At over 1000 meters above sea level, the park overlooks the major ancient commercial roads between the Ionian colonies and the Tyrrhenian towns, and still boasts stretches of a long defensive wall, erected during the Hellenic era.